In terms of mere functionality, one of the best examples of wooden TV stands for flat screens would be a stand with a TV bracket. This way, you have a chance to fix your flat screen TV onto the wall and use lower units for storing all sorts of objects – from additional media units to little trinkets you would like to keep on display. Speaking of additional decorative materials, there will also be quite a few options to consider. There is, of course, glass – one of the most stylish and interior neutral additions to any furniture model. Wooden TV stands for flat screens can be equipped with glass shelves or glass cabinet doors – depending on the particular model you choose. Wood and glass can fit flawlessly both into modern and traditional rooms – and in the mixed interiors, of course. Chrome elements are hardly ever the primary ones when combined with genuine wood. Most usually, they serve a strictly functional purpose. Generally, those are TV stand legs or door handles. Still, this shiny stylish material catches the eye and gives any TV stand a modern and bright look. Though traditionally legs and doors had silver color, this year collections also feature a lot of golden shades. A relatively unusual combination that requires at least one more glossy unit in the room. On the whole, a combination of natural wood shades and decorative inserts with high gloss finish looks very modern; plus, models like these are not exactly widespread, so if you are looking for something unique, this could be it. Finally, some wooden TV stands for flat screens will be made of reclaimed rustic wood exclusively. Most of them will feature chunky, down to earth design, which is, of course, a fantastic fit for rustic rooms. Oak is one of the most popular materials. 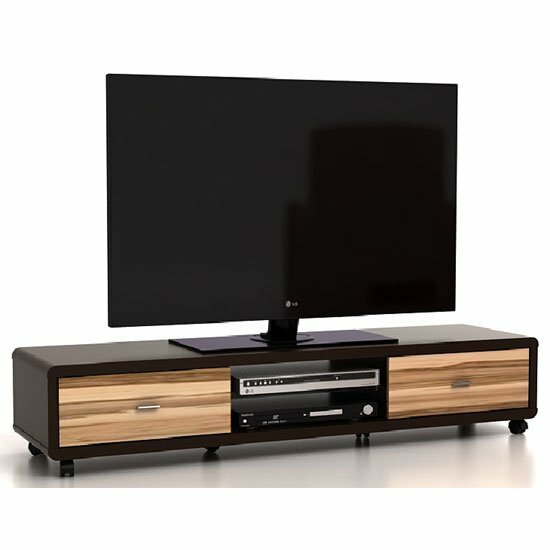 A very interesting selection of wooden TV stands for flat screens can be found at Furniture in Fashion . This is one of the biggest e-commerce platforms in the United Kingdom, offering not only gorgeous choice of stylish models, but also low prices and additional discounts on selected products. In addition, this is one of the few stores that can actually ensure quick delivery to any part of the country and offer a chance to visit company showroom any time you would like to personally examine the units. The facility is open from Monday to Saturday and always has at least 90% of the listed items on display.